Organic chocolate bars and organic chocolate truffles are the more commonly available forms of organic chocolate. Organic cocoa nibs (bottom left) and organic whole cocoa beans (bottom right) will pack the biggest health punch. There is no mistaking it, chocolate is a treat that nearly everyone loves to enjoy. And recent articles touting its health benefits are only sweetening chocolate's allure. But what about Fair Trade chocolate and organic chocolate? Are suppliers simply trying to jump on the bandwagon or is there more to it than that? It's ironic that chocolate-filled hearts abound near Valentine's Day. Chocolate is rich in flavonoids, which not only exhibit a cancer-fighting antioxidant effect, but also promote a healthy cardiovascular system, according to a recent study at University of California, Davis. The darker the chocolate, the more flavonoids. But, because flavonoids can be lost in processing, manufacturers are looking into market forms that retain more flavonoids, namely cocoa nibs (small bits of shelled, cured, cleaned, dried and cracked cacao beans) and whole cocoa beans. One supplier even produces minimally-processed ground chocolate, a process dating back centuries when chocolate was used for its healing properties. Reports seem to be positioning chocolate as the next superfood, alongside green tea, blueberries and red wine. Yet according to the National Confectioners Association, 65% of American chocolate eaters prefer milk chocolate. Per the FDA's requirements, milk chocolate may contain as little as 10% by weight chocolate liquor (the solid or semi-solid paste from finely ground cacao nibs). The rest can be anything from cocoa butter, milk or milk solids, sweeteners, natural or artificial flavors, and emulsifiers. While reports with health claims do justice in stating that most health benefits are obtained from dark chocolate (60% to 70% chocolate liquor), the majority of consumption sways to the side of little value. Chocolate is rich in flavonoids, which not only exhibit a cancer-fighting antioxidant effect, but also promote a healthy cardiovascular system, according to a recent study at University of California, Davis. Add pesticides, antibiotics and growth hormones to the mix and the once-healthy chocolate quickly becomes a food unfit for the human body. The dairy industry has received much press lately condemning the use of antibiotics and rBGH (recombinant Bovine Growth Hormone) in dairy cows. What is not so widely publicized is the high level of pesticide use in cacao plantations. The cacao tree is a shade tree, often growing under the rainforest canopy. Large cacao plantations grow the trees in direct sunlight, increasing the plants' need for fertilizers and pesticides to counter the stresses from growing in the wrong environment. Can chocolate be saved? Absolutely. With sustainable agriculture as defined by Fair Trade, cacao is cultivated in small plots under the proper growing conditions without the use of synthetic fertilizer, harmful pesticides, herbicides or fungicides. Not only is this beneficial for the cacao crops, but also for the surrounding vegetation and migratory songbirds. Better yet, certified organic chocolate, also requiring the use of sustainable agriculture, only can be combined with other organic ingredients: organic raw sugar, organic hormone- and antibiotic-free milk, and natural flavors. This is a costly proposition as the cacao crops can be heavily damaged or even completely wiped out by disease. Farmers in impoverished areas can't always afford the high cost of responsible farming or risk losing some or all of their crops, hence the reliance on pesticides and fertilizers. Again, this is where Fair Trade comes to the rescue, ensuring cacao farmers a fair price for their cacao beans, allowing them to farm sustainably. Thankfully, organic chocolate and fair trade chocolate is becoming more prevalent. Major grocery store chains as well as local specialty markets and health food stores are carrying organic and fair trade chocolate. In addition to the usual dark, milk and white chocolate, you can find organic truffles, organic chocolate chips, organic cocoa, organic cocoa butter, raw organic cacao nibs and beans...even organic chocolate flavor extract. 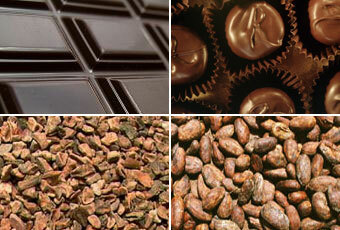 For an exhaustive list of organic chocolate suppliers, see our Organic Chocolate Supplier list. Marketing Hype or the Real Thing? What remains is the question of whether companies are riding the bandwagon or not. Certainly, one should question the motives of chocolate manufacturers that have a small organic chocolate offering mixed in with their conventional items. It's fantastic that major players like Callebaut and Valrhona each offer a line of organic chocolate. This gives mass producers, bakeries and smaller chocolate artisans access to the bulk quantity they need from the companies that already supply through distributor channels. Does this represent a shift in thinking about the ecological impact of conventional methods or is it a way to monetize on a growing market segment? Time will tell. In stark contrast, look at companies like Endangered Species, Yachana Jungle Chocolate, Equal Exchange, Dagoba, Rapunzel and Green & Black's...just to name a few. These companies, which only carry organic or fair trade chocolates, show a clear commitment to eco-friendly cacao farming as well as to the farmers and their communities. Visit their Web sites and read their stories. Then think about who you will support with your organic or fair trade chocolate purchase and make a responsible choice.